Tile Tech Roof Pavers offers a solution for all roofing / waterproofing needs from standard Roof Ballast and Walkway, to Plazas and Green Roofs. Granite-Tech finish gives slip resistant properties and by elevating the pavers, water is channeled away from the surface. Safer than gravel ballast, roof deck pavers make roofs and plazas safe for pedestrians and simplify repairs. Roof ballast, functional design, color and durability all come together with Tile Tech roof and deck pavers. In choosing a practical, appropriate roof paver for your projects, many factors to be considered are now easily accommodated by new designs that are both functional and aesthetically pleasing. There are now different kinds of pavers for deck and roof made for different feature preferences. 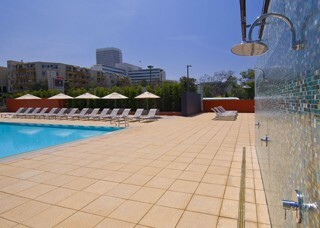 There are lighter-colored roof pavers designed to have a higher reflective value and low emissivity rate to help reduce the heat island effect, which contributes to global warming. 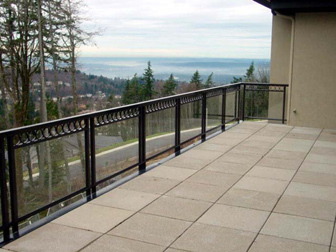 These are ideal for practical and yet attractive rooftops, terraces, balconies and plazas. 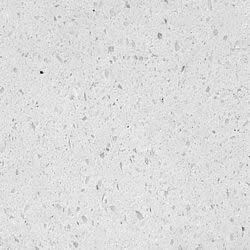 There are also those made with a surface design that mimics the features of granite. The granite-like appearance and slip-resistant qualities makes these roof pavers have the natural beauty and functionality of granite, including its high strength attribute. 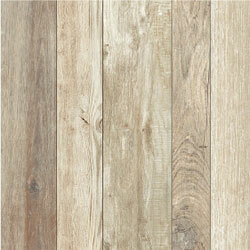 Like the granite ones, there are also those that reproduce the texture, color and appearance of slate. Available in different colors, texture and stamp designs and aggregate mixes, these slate-like roof pavers are salt-water resistant and resistant to water absorption and surface damage such as cracking and chipping. Also one of the new designs for pavers, are those that made from a mixture of natural fossil shells and other aggregates that makes the appearance vary for each piece, replicating the appearance of natural stone. 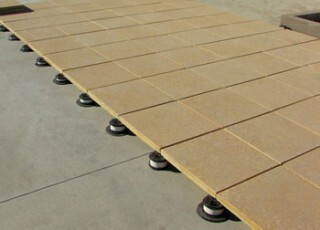 And the new manufacturing techniques used for these architectural pavers made them more durable and longer-lasting. Also, the use of shells and other marine fossils that are natural fossil wastes is engineered to serve as an eco-friendly alternative that helps reduce the negatives of mining stone. And to speak of eco-friendly, there are also attractive but very functional designs that use recycled glass to make colorful pavers. And of course, there are also the more traditional wood tiles for rooftop paving projects that are popular for many modern design plans. In choosing roof pavers for your project, you already have a vision of what functions and appearance you wanted to attain. Picking the relevant color scheme, the texture and material appearance is easy with suppliers with a wide range of paver color and material aggregates. Checking out the manufacturing techniques will ensure that you will be able to choose pavers with the best quality for safety and longevity. Choosing longer-lasting pavers will save you further costs for maintenance and will provide you with functional and attractive roof pavers for many years to come. With the right inspiration, proper guidance and information regarding modern styles and features, your roof paver project will surely be a success. 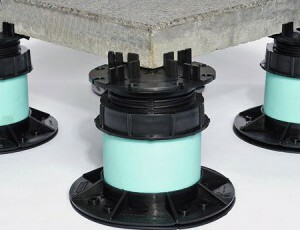 Tile Tech Pedestal Paver systems are the ideal solution for roof ballast, plaza decks and terrace converting them into functional & attractive spaces. 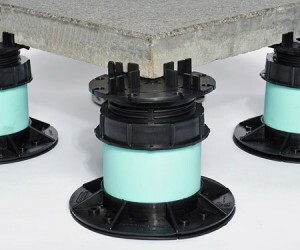 Adjustable Pedestal systems elevates, levels and uniformly spaces the paver and protects the substrates in such waterproofed installations as roof decks and promenades, terraces, balconies, patios, podiums, plazas, arenas and roof gardens. It is also ideal for roof garden walkways, for use as support pedestals or sleepers for catwalks, mechanical access walkways, balcony-deck structures and roof-mounted duct pipes. 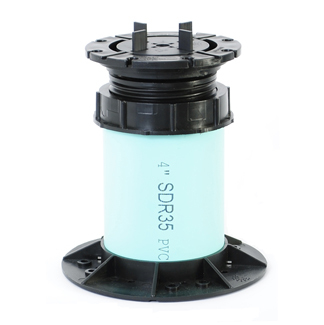 They also allow easy access to the roof and waterproofing system for making repairs or standard maintenance procedures. Roof Pavers are manufactured using a hydraulic press resulting in a high psi strength (>8,000psi) to withstand tough applications & climates and are highly suited for roof deck applications. 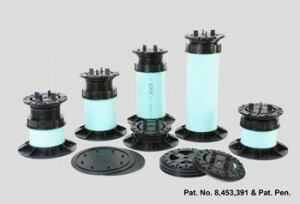 Roof Pedestal System elevates, levels and uniformly spaces the paver for proper water drainage & air flow. 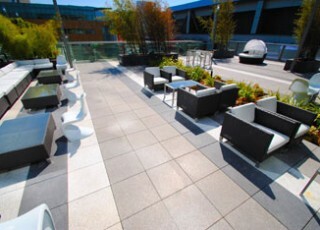 We have developed several series of pavers that provide reflectance and emissive values providing great performance to the Green Roof concept. 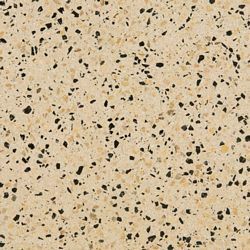 Are produced using recycled crushed granite & aggregate within a color cement matrix.The pavers are ground to expose natural beauty of the granite chips and can be honed or shot blasted for a granite-like, slip resistant paver. Stamp-Tech Slate pavers have been designed to reproduce the texture, color and appearance of natural slate. 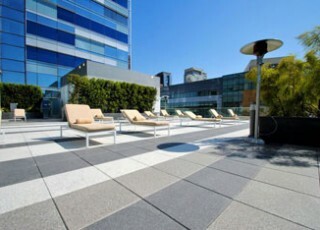 Porce-Pave™ pavers are comprised of a 20mm single layer of load-bearing porcelain designed for use in conjunction with raised pedestals on roof decks.